When you’re looking for waterproof flooring in Seaside, OR, from a trusted source, our local showroom is the place to be. We sell and install a wide range of Downs H2O and Tigressa H2O in all textures, styles, designs, and colors, so there’s something for everyone. Our owner is involved with every job, so you know there’s someone in charge with years of experience and specialized expertise. All of our installations are guaranteed for the life of the floor, making us the most reliable source in the area for quality products and professional installation. An investment in our waterproof flooring installation is sure to pay off when your home value increases. New floors can transform a space and update a room, so it looks much newer. In the case of waterproof materials, there are the added benefits of lasting durability, minimal maintenance, and versatility in terms of placement. Even if you decide to one day sell your house, you’ll be reaping a high reward for having purchased a floor from us. Indoor air can be just as or even more polluted than outdoor air, but the right floor can help tremendously. We stock an abundance of Downs H2O products that are made with a 100% guaranteed waterproof seal. This seal keeps out dirt, dust, pollen, animal dander, and other allergens so that those who suffer from allergies or asthma can breathe easier. We take pride in selling floors that are healthier for everyone and easy to keep that way. Routine sweeping and mopping are all it takes; no special cleaners are needed. 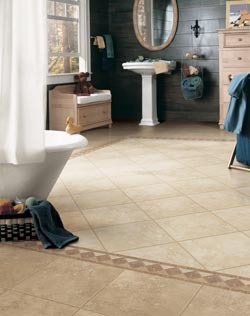 Waterproof vinyl flooring also satisfies aesthetic needs. We carry diverse designs and colors that are sure to please everyone who sets foot in our store. With several years of serving the locals under our belt, we’re confident we can meet any need and match any theme. The fear of stains and odors has sometimes made homeowners shy away from carpet, but our Tigressa H2O waterproof carpet quells this fear perfectly. The floor is designed to dissipate all kinds of odors—including smoke—while preventing liquids from infiltrating the subfloor. This makes it completely kid-proof and pet-proof. You can let the little ones run around and play with the knowledge that whatever messes they make can easily be cleaned up with no trace left behind. Contact us to learn more about the benefits a waterproof floor can bring. We serve the residents of Seaside, Astoria, Cannon Beach, and Manzanita, Oregon, and the neighboring communities, as well as on the Long Beach peninsula.